I have used/bought every under the sun! Finally, I found Happy Jack! This stuff is awesome! I couldnt believe how good this stuff was, not a flea one for at least a month! I didnt order it off line, i got it at my local tractor supply but its actually cheaper online, so I will consider that next time. My dogs were so happy not to be bothered by itching and scratching! Thanks Happy Jack! "I have used this dip on my 3 Rottweiler's every 3 months or so and it works wonderfully!" I have used this dip on my 3 Rottweiler's every 3 months or so and it works wonderfully! You actually see the fleas dead on and off of your pet. Works instantly and doesn't smell bad. This is the best flea dip on the market! I alternate between this and using topical Frontline (which I really don't like using too much.) We haven't had a flea issue since the very first dip!! We also dust our yard with Diatomaceous Earth during dry season. This dip is pricey, but highly recommended! "This is the best flea shampoo I've found, and is the only one I use for my lab." This is the best flea shampoo I've found, and is the only one I use for my lab. No negative side effects in the five years I've used it, and you can litterally see it working to kill the fleas as you shampoo. "This year is horrible for fleas in VA and the Happy Jack Kennel Dip II is the best product on the market - - - hands down." German Shepherd & Dachshund. Family pet. I and my extended family have used Happy Jack products for over 50 years, at least it seems that long. 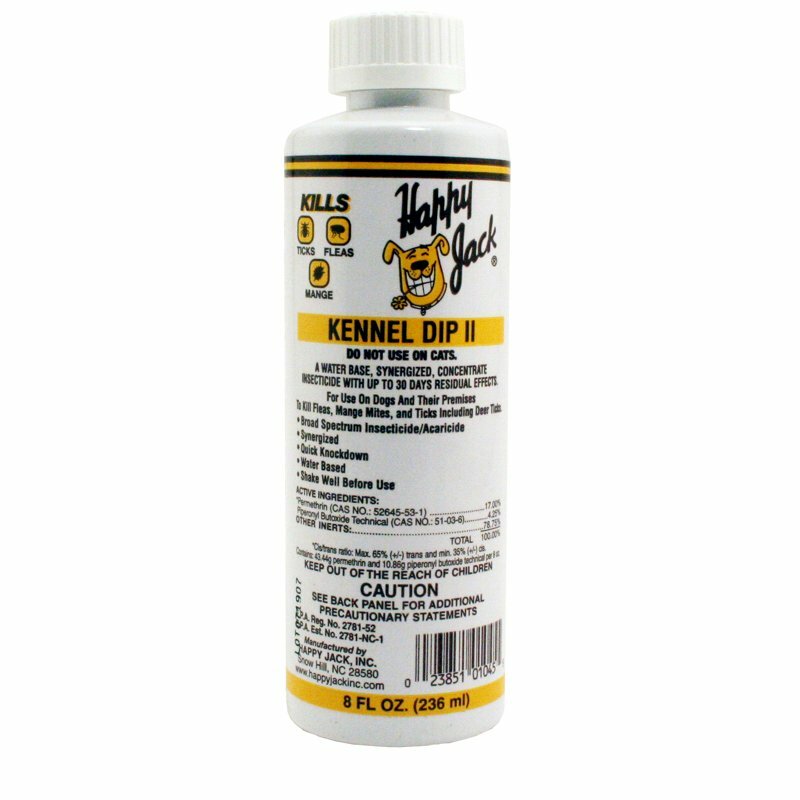 This year is horrible for fleas in VA and the Happy Jack Kennel Dip II is the best product on the market - - - hands down. I sometimes wonder why the company is not advertising it on TV. This year (2012) I am sure there are numerous dog owners who would welcome knowing about the relief this product provides their companions. Hello - - - anyone at Happy Jack listening? I would gladly appear as a spokesperson! "Kills and prevents fleas and doesn't drive dogs crazy"
I have tried EVERYTHING, and the Happy Jack kennel Dip is really the only product that REALLY works!!! I can't find it in any stores in my area. This is the second time I have bought it from your web site, and one bottle last ALL summer long. Thank you very much. I am also moving to the country soon and won't have a fenced yard like I do now, and I plan to buy one of your electronic fences for her. Your website is extremely affordable, and the videos that go along with you products are extremely helpful. I give Gun Dog Supply 10 thumbs up!! chihuahua and shihzu. Family pet. This worked great for 3 of my 4 dogs. My Chihuahua got very sick..infact had to take him to the vets. He almost instantly got lethargic and wouldn't walk. Scared me to death. We only use on 3 of our 4 dogs. My suggestion would be not to use on really small dogs - that was the suggestion of the Vet as well. I used this on my two chihuahuas one evening. I followed the directions on the bottle closely. The next morning I noticed that my 1-year old chihuahua was very lethargic. My 3-year old chihuahua was also acting very strange. She seemed very disoriented and restless. Both of my dogs were not walking normal either. I bathed both of them in Dawn soap to wash this stuff off. The next morning, both of them were back to normal. I will NEVER use this crap again! Rated 1 stars from 1 user ratings. Happy Jack Kennel Dip II -- 8 oz. Happy Jack Kennel Dip II is a water based, synergized, concentrated insecticide with up to 30 days residual effects. For use on dogs and their premises to kill fleas, mange mites and ticks including deer ticks (carrier of lyme disease). NOTE: DO NOT USE ON CATS. Shake well before use. Protect from freezing. Add the required amount of concentrate to water and blend thoroughly. Do not hold dilutions for than 24 hours. Food utensils such as teaspoons and measuring cups must not be used for food purposes after use with pesticides. Do not treat puppies under 12 weeks of age. Do not get this product in your dog's eyes or mouth. Retreat dogs as needed but not more often than once every fourteen days. Mix the product and apply the use-diluted material to dogs and/or their premises at the rates shown. These dilutions and rates will provide the most efficient pest control under conditions of heavy pressure (infestation) when good contact is achieved. Spray, Dip, or Sponge On: Mix 1 part concentrate in 256 parts water (1 fl. oz. in 2 gal. or 30 mL in 2 gal. or 8 fl. oz. in 16 gal.). Spray, dip or pour diluted product on the dog until the dog's hair and skin are thoroughly wet (saturated), making sure the dog's entire body is treated. Do not treat dog's face. Let drip dry on dog and do not rinse off. Low Volume Spray: Mix 1 part concentrate in 32 parts water (1 fl. oz. or 30 mL in 1 qt.). Spray 1-2 fl. oz. per dog. Starting at the tail, stroke against lay of the hair, spraying the parted hair with a fine mist directly behind the hand to insure penetrating the hair coat. Spray entire dog until the hair coat is damp. Indoor Premise Spray: Mix 1 to 2 parts concentrate in 80 parts water (8 fl. oz. in 2.5 to 5 gal. or 1 pint in 5 to 10 gal. or 48 mL to 96 mL in 1 gal.) Thoroughly spray infested areas, pet beds, resting quarters, nearby cracks and crevices, along baseboards, moldings, windows and door frames, and localized areas of floor covering. Do not exceed 0.56 lbs. active ingredient per 1000 sq. ft. of treated area. Fresh bedding should be placed in animals quarters following treatment. Outdoor Premise Spray: Mix 2 fl. oz. (60 mL) concentrate in 10.5 gal water or 14 mL in 2.5 gal. water. Use enough finish spray to penetrate foliage, usually 50-100 gal. per acre (1.2 gal. per 1000 sq. ft.). To prevent infestation of buildings, treat a band of vegetation 6-10 feet adjacent to the structure.